Please select a Lens to view availability. After being relentlessly blasted in the face with roost, bugs, branches and miscellaneous filth, your goggles will eventually need new lenses. 100% Racecraft, Accuri and Strata Goggles are all designed for easy lens swaps. Freshen up your face and vision with 100% Replacement Goggle Lenses. Smoke lens - Neutral tint reduces glare while providing accurate color perception in medium to bright light conditions. Colored Mirror lenses - Mirrored finish offers the maximum reduction of glare in bright light conditions for improved performance and visibility. Many to choose from, and quality is great! Many colors to choose from, very affordable, it doesn't fog on extreme weather. I bought the silver mirrored replacement lens. It went relatively easily into my 100% racecraft goggles (just follow the directions on the back of the package). I was hoping for them to be completely non-see-through, and for the most part they are, but there are certain light conditions where you can see through them. I would say they're 85% opaque. I can't say if other mirrored goggles are this way as well, but I wouldn't be suprised. A little pricey. I thought it was odd some goggles come with limited lens options, but it's easily bypassed by getting the lens separately. I got the blue mirror and it's good but translucent - not quite as reflective and the gold so people can see my eyes. Still, not a big deal. 100% is good. Hard to install without getting 62 fingerprints all over it. I bought the 100% Accuri goggles, and also bought the Smoke replacement lens to interchange with the Mirror Gold lens the goggles come with. So, I have three different options: clear, mirror gold, and smoke. Are any of these lenses fit 100% Strata? BEST ANSWER: Yes. Accuri, Racecraft, and Strata are the same lens. Does this lens work with all 100% goggles? will it fit with the OTG goggles?? BEST ANSWER: Yes it will fit the Accuri OTG as mentioned in the product description . Yes it will fit the Accuri OTG as mentioned in the product description. BEST ANSWER: not sure what OTG means. "Over The Glasses"?? 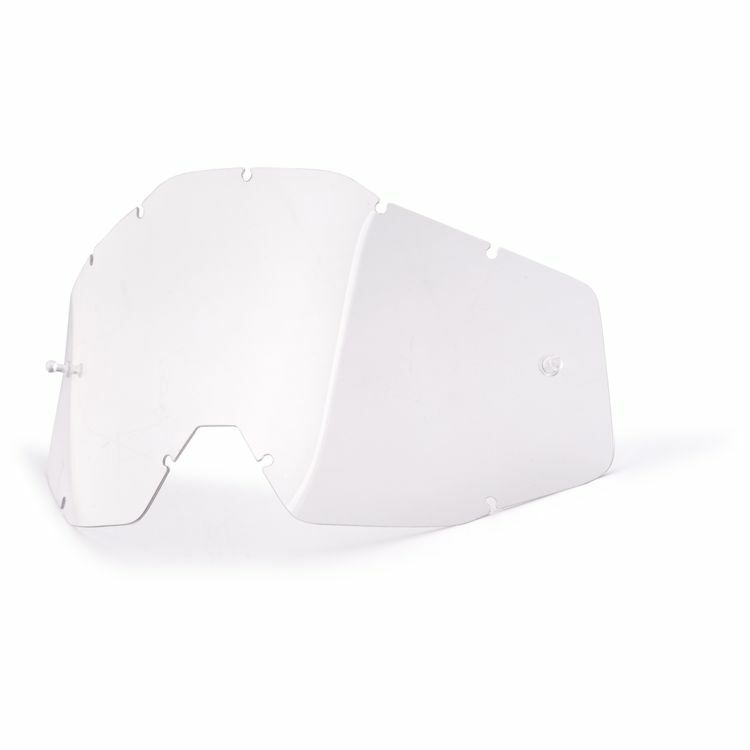 I didn't know that 100% made an OTG goggle. If i buy the 100% Accuri Goggles in Pure Black and I buy the silver mirror shield here, will the clear shield of the goggle just come out and the mirror shield just click in? Thanks! Now to see if it will fit in the IS-MAX BT helmet and my purchase will be secure..
does this lens work with Thor goggles? is there any lens besides clear that work good at night? I'm liking the blue lens but not sure how it would be like at night. BEST ANSWER: I bought the Red lens. So I can only speak for it. The actual lens seems to have two separate kinds of protection. The most obvious is the red mirror on the outside of the lens as seen in the pictures. The second part isn't noticeable until you actually put the goggles on your head and are looking through them. There is a smoked tint at the top of the lens (near your eyebrows) that fades to clear at the bottom of the lens. Sort of like a lot of windshields on cars. I have found the lens to be perfectly usable at night. But it's definitely not the same as using a solid clear lens. It's probably going to be different for everybody. Worse case, get a second goggle for night riding. Does the smoked lense provide UV protection? Is the silver mirror clear lens based or smoke lens based?